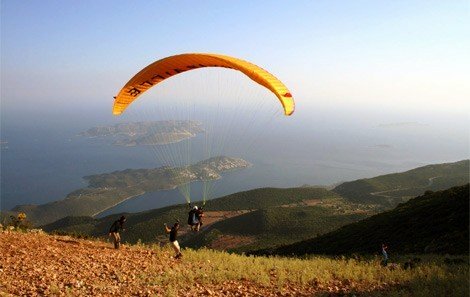 Paragliding over Kas Paragliding in Kas is another popular activity that can be done any time between the months of April and October. The reason why it is a very popular site is because the size of the hills behind KaÅŸ is uniquely suited for paragliding with not so many tall buildings and so many lush greens. The thrill of it is the excitement when flying over beautiful coastal scenery. Enjoy the safe flying in the hands of our professional pilots who will sit in a suspended harness below a fabric wing, whose shape is formed by its suspension lines and the pressure of air entering vents in the front of a wing. If your children want to join this activity, they must be at least 9 years of age with the permission of parents or guardian. However, the child does not have to be accompanied by parents or guardian at all time once the parents of a child approve a flight. Let the pilot know how you want to be part of this very special activity of your child because you can either choose to go up with them or stay in the harbour and watch them landing. You can be sure that this excursion will make everyone in the family so thrilled and never forget such excitement that you share together. Itinerary: The take off point is less than 20 minutes from KaÅŸ and at a height of 1000 meters (3300 ft). It is such a exciting sight to see the hills which the gliders can safely come close to them, so close that you can even see many creatures such as eagles or mountain goats. 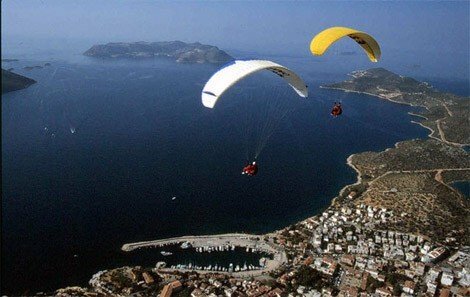 Not only that, but you will also see the Old Town of KaÅŸ, its harbour, the peninsula and of course, the Greek island of Kastellorizo (Meis) from the birdâ€™s eye angle. Try tandem paragliding once and we challenge that you will never forget the experience! Our paragliding excursion provide super safety trips for you with our professional pilots and their captain who believe in safety first and always. You will be guaranteed to have a thrilling but safe experience. Our three experienced pilots fly up to six sorties a day everyday will ensure your safety. You will be briefed and issued with a helmet and flying suit while all pilots carry reserve chutes and communication systems. Be warned though that there is no flight if there is any meteorological contra-indication on any given day. The paragliding team has pride in having over 20 years of experience. So just relax and enjoy the ride and feel that gentle fresh air on your face. After such fun excursion you will be transferred back to your port of call. Our Team Captain is the one who goes last after his co-pilots have safely taken off from the starting point. He then has a chance to check the equipment and each passenger again before the take off. There is a vehicle driver who is waiting to assist in his take off. With such a careful operation, you are guaranteed to give the planet big smiles while flying above.